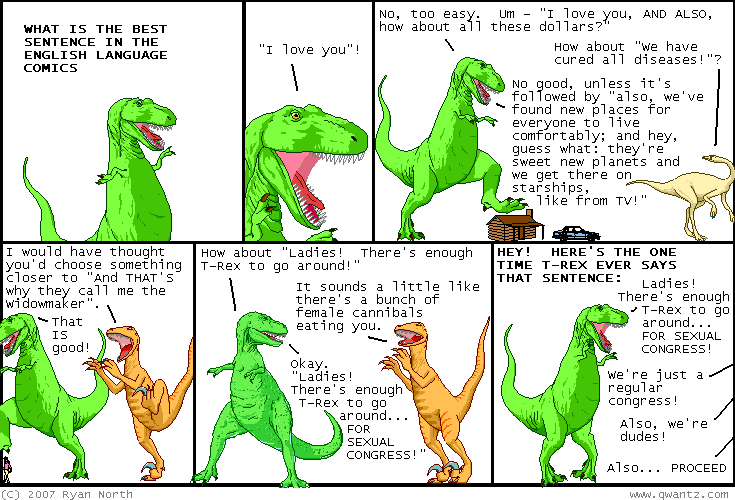 Dinosaur Comics - June 19th, 2007 - awesome fun times! –AND so fun! AND a recipe for a one-man party! June 19th, 2007: I came across storg.net through their Project Wonderful ads somewhere, and it looks pretty cool! People can submit stories that have happened to them and they end up on the site. The stories are the kind of things you'd hear when meeting a friend of a friend at a party, which are usually pretty good stories! I think there's only about 50 or so on the site so far, but you can change that by contributing your own. The only danger is that years from now people will accuse you of stealing your own story off of storg.net, and when that happens you can blame me I guess? I guess I'm cool with that. Hey, I'll be in NYC for the MoCCA Arts Festival this weekend, June 23rd and 24th. If you are wanting to break into my house that would be a good day to do it, except that I have roommates so maybe you shouldn't break into my house. Please don't break into my house.